The Splat Witch is built in our workshop. The witch is hand painted with green skin in a black outfit. She is on a brown broomstick. She has smashed into a brown tree. The dimensions for the yard sign are 28 inches tall by 21.50 inches wide by 1.50 inch deep. The arts and crafts sign has a 34 inch stake. The weight with packaging is 3.75 pounds. For the continental U.S. shipping and handling is included in the listed price. For shipping outside the continental U.S. please contact us through our Contact Us page. The Trixie Treater Girl is built in our workshop. 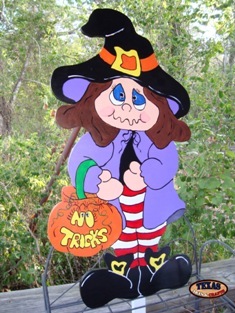 The witch is hand painted with a purple cape, red and white striped pants, and a black hat. She is holding a pumpkin that reads No Tricks. The dimensions for the yard sign are 32 inches tall by 16 inches wide by 2 inch deep. The arts and crafts sign has a 30 inch stake. The weight with packaging is 10 pounds. For the continental U.S. shipping and handling is included in the listed price. For shipping outside the continental U.S. please contact us through our Contact Us page. The Witch with Cauldron is built in our workshop. 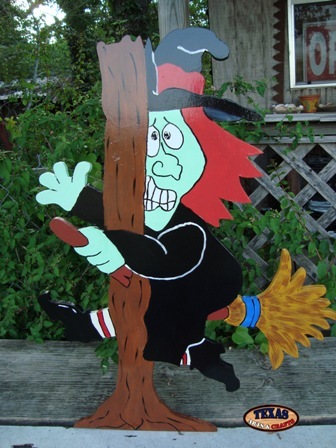 The witch is hand painted with green skin in a black outfit. She is holding a black bat. She is stirring a cauldron with a blue octopus. The dimensions for the yard sign are 29 inches tall by 15 inches wide by 1.50 inch deep. The arts and crafts sign has a 25.50 inch stake. The weight with packaging is 4 pounds. For the continental U.S. shipping and handling is included in the listed price. For shipping outside the continental U.S. please contact us through our Contact Us page. The Witch in Pot is built in our workshop. The witch is hand painted with a purple hat. There is a black cat on her head. She is in a black cauldron with green bubbles. The dimensions for the yard sign are 21 inches tall by 15.50 inches wide by 1.50 inch deep. The arts and crafts sign has a 23 inch stake. The weight with packaging is 3.75 pounds. For the continental U.S. shipping and handling is included in the listed price. For shipping outside the continental U.S. please contact us through our Contact Us page. 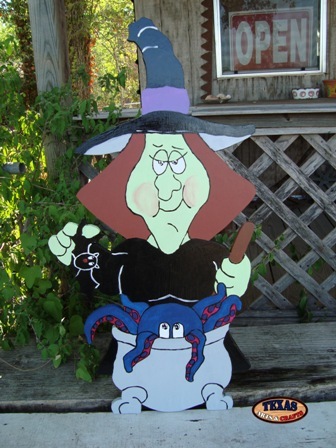 The Witch With Frog is built in our workshop. 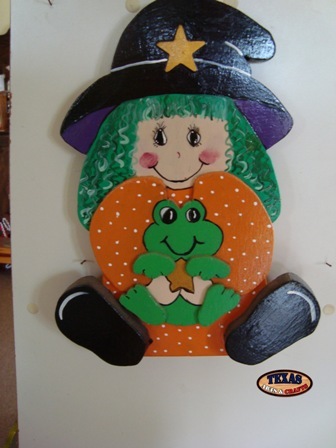 The witch is hand painted with green hair, black hat, and an orange outfit. The frog is painted green. The dimensions for the hanging sign are 13.50 inches tall by 10.50 inches wide by .50 inch deep. The weight with packaging is 2 pounds. For the continental U.S. shipping and handling is included in the listed price. For shipping outside the continental U.S. please contact us through our Contact Us page. The Witch Hanger is built in our workshop. 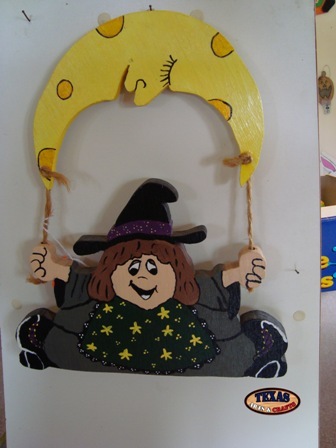 The witch is painted purple yellow and black. The background is painted black and yellow. The pumpkin is painted orange. 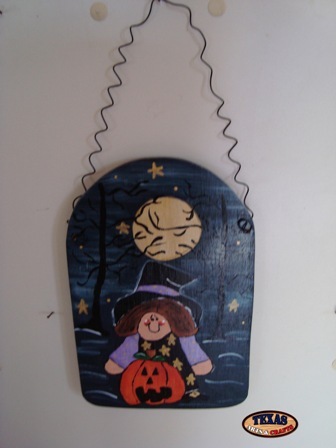 The dimensions for the hanging sign including the wire hanger are 13.50 inches tall by 6.50 inches wide by .25 inch deep. The weight with packaging is 1.50 pounds. For the continental U.S. shipping and handling is included in the listed price. For shipping outside the continental U.S. please contact us through our Contact Us page. The Witch Moon is built in our workshop. The witch is painted in a gray and black outfit. Her hat is black with a purple band. The apron is green with yellow stars. The moon is painted yellow. The dimensions for the hanging sign are 15 inches tall by 12 inches wide by .50 inch deep. The weight with packaging is 2 pounds. For the continental U.S. shipping and handling is included in the listed price. For shipping outside the continental U.S. please contact us through our Contact Us page.